The latest Funko Pop! 2-Pack contains the Mad Titan in his Avengers: Endgame armor while Hulk is featured in his Quantum Realm suit. It isn't abundantly clear why the two are packaged together, but it has led to speculation that we will see a round 2 fight between the two characters. As for the "Advanced Tech Suit," or Quantum Realm suit, we're not exactly sure what they will be used for, but it is widely believed that they will allow Earth's Mightiest Heroes to traverse the mysterious realm in an effort to stop Thanos. The Funko 2-Pack appears to be a Barnes and Noble exclusive. After Hulk's meeting with Thanos, Bruce Banner was not able to summon him again to help out during Infinity War. Some fans believed that Hulk was scared of the Mad Titan, but the Russo Brothers have debunked that theory. Instead, there is a lot more going on underneath the surface which has nothing to do with fear of battle. As it turns out, it's more of a personal thing between the two. Joe Russo explains. "What makes him unique as a character is that there is a host body that is being fought over by two distinct personalities who hate each other. And both want control of the host body... So we thought an interesting direction to take him in is what if Banner, who typically uses the Hulk to solve crisis situations, what if the Hulk were no longer interested in solving those problems for Banner? So that the relationship is becoming increasingly dysfunctional. That's what's going on here. People have speculated whether there was some fear on the Hulk's part about having to face Thanos again. But I think ultimately what it is, is that he's tired of playing hero to Bruce Banner." There are so many characters that MCU fans want to see take down the Mad Titan. 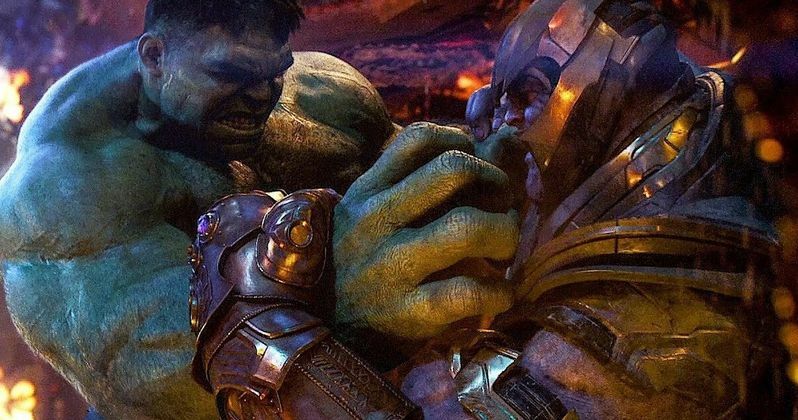 Hulk is an obvious choice because we all want to see a rematch in Avengers: Endgame. However, Nebula has some very personal reasons to want to defeat her father. Thor and Captain Marvel are also pretty big candidates. As for who or what will do the job, we'll just have to wait and see what Marvel Studios has planned for us. You can check out the Funko 2-Pack of Hulk and Thanos below.